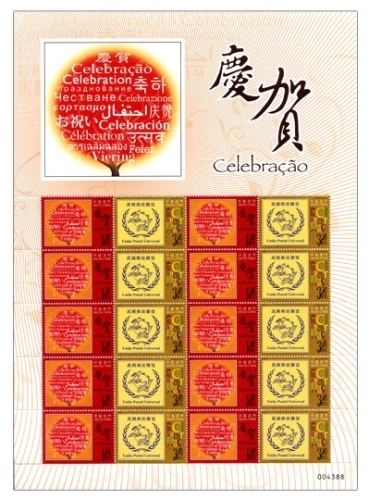 In celebration of the “World Post Day” that celebrated by the worldwide post offices on 9th October every year, Macao Post especially uses the theme of “Celebration” to issue new stamps on 9th October, 2008 in order to celebrate this significant day. With a set of two stamps, one shows a celebration tree made up of different languages in symbolizing the unity of the world while the other shows the emblem of Universal Postal Union. The stamp issue incorporates the issue of personalized stamps with the same theme. This is the second issue of personalized stamp and the first personalized stamp in the theme of “Love and Blessings” was issued on Mother’s Day in 2005. For the customers who have successfully subscribed the personalized stamps on or before 31/08/2008, customers can bring along the subscription receipt and I.D. Card to the Macao Post Headquarters at the above working hour for collection on the issue day. A temporary counter will be set up on 09/10/2008 to provide the subscription service for personalized stamps; the subscribed products will be available for collection at the Philatelic Shop of Macao Post Headquarters with approximately 20 working days. 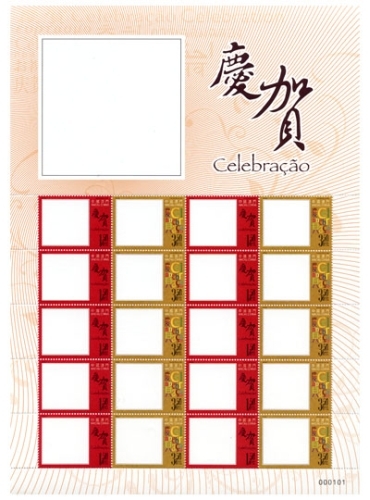 The First Day Cover without stamp will be available for sale at the Macao Post Headquarters on the issue date, customers can produce their own First Day Cover by stamping the personalized stamps with the issue postmark for your collection or mail to your beloved friends and relatives in sharing your joyfulness. The stamp design and the text for the information brochure are both done by Macao Post. This is the nineth issue in 2008. The issued stamps are as “Lunar Year of the Rat” on 23/01/2008; “I Ching, Pa Kua VI” on 01/03/2008; “Beijing 2008 Olympic Torch Relay” on 03/05/2008; “Legends and Myths VIII” on 02/06/2008; “Local Delights” on 04/07/2008; “World Heritage” on 31/07/2008; “The Opening of the Beijing 2008 Olympic Games” on 08/08/2008 and “20th Macau International Fireworks Display Contest” on 01/10/2008. Macao Post announced that a Temporary Post Counter will be set up at our Philately Shop located at Macao Post Headquarters and the Communications Museum on 9th October 2008 providing the commemorative cancellation service for the “World Post Day – UPU”. To cope with Promotion of the Traditional Chinese Medicine in China - Macao, Macao Post announced that a Temporary Post Counter will be set up at Tap Seac Plaza at 14H00 to 18H00 on 12th October 2008 providing the commemorative postmark cancellation service for the “Promotion of the Traditional Chinese Medicine in China – Macao”. 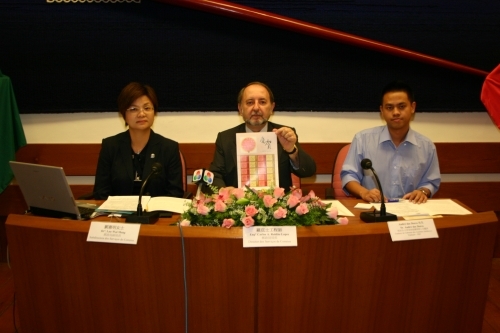 To cope with the 13th Macao International Trade & Investment Fair, Macao Post announced that a Temporary Post Counter will be set up at Venetian Macao Convention & Exhibition Center, on 23rd to 26th October 2008, providing the commemorative postmark cancellation service for the “13th Macao International Trade & Investment Fair”. To celebrate the 50th Golden Jubilee of The Photographic Society of Macao, Macao Post announced that a Temporary Post Counter will be set up at the Macau Fisherman's Wharf Main Hall at 15H00 to 19H00 on 26th October 2008 providing the commemorative cancellation service for the “50th Golden Jubilee of The Photographic Society of Macao”. A commemorative envelope priced at MOP3.00 will be issued, together with the various philatelic products available for sale during the above activity. To commemorate the 17th Conference of The Electric Power Supply Industry, Macao Post announced that a Temporary Post Counter will be set up at the Venetian Macao Convention & Exhibition Centre at 09H00 to 17H30 on 27th October 2008 providing the commemorative postmark cancellation service for the “17th Conference of The Electric Power Supply Industry”. Macao Post will participate the Exhibition “Beijing International Stamp & Coin Exposition 2008”, located at Beijing, China, during 24th to 27th October 2008. 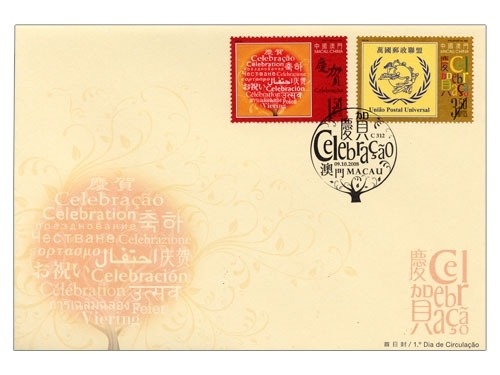 To commemorate this Exhibition, Macao Post produces the commemorative envelopes and provides the commemorative postmark cancellation service for the “Beijing International Stamp & Coin Exposition 2008” on site of the exhibition. 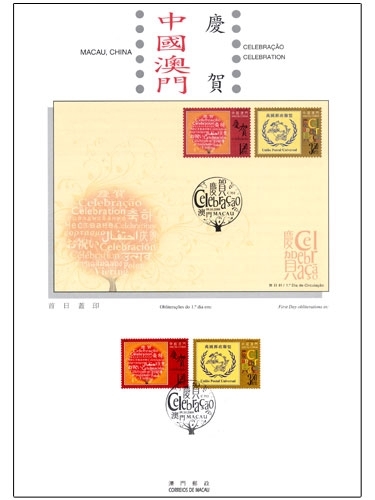 Be convenience to the philatelist, the commemorative envelope with stamp priced at MOP3.50 will also be available for sale at the Philately Shop of Macao Post Headquarters staring from 24th October. * No commemorative postmark cancellation service provided in Macao.